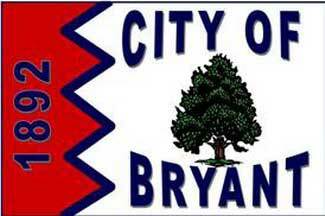 "Flag designer LaVenia Jones gave the following clarification of the design of the City of Bryant Flag. The red panel represents the early history of the area. The Civil War Skirmish at Hurricane Creek occurred on October 23, 1864. Many lives were lost, women from Bryant went to the site of the skirmish, recovered the dead and tended the wounded. The dark blue zig-zag represents the Hurricane Creek that flows through the town and upon which the early inhabitants depended. The dark blue 1892 is the year the City of Bryant became an incorporated town. The tree represents the natural beauty that caused a group of early pioneers going through the State on their way to Texas and came to Hurricane Creek to find it too high to cross for a few days. They made camp and rode around on their horses for most of the day while they were waiting for the creek to go down. They liked the beauty of the area forested with trees and made their home here. It also represents Bryant's recent commitment to preserve and enhance the same desirable environment for Bryant residents. Taken together the red-white-blue echo the colors found in the Flag of the United States, and the Flag of the State of Arkansas."